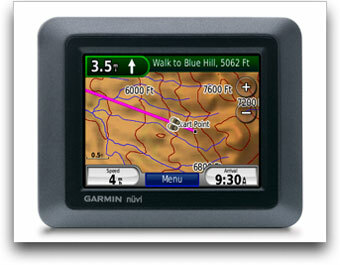 Perfect for crossing over the threshold from city to backcountry, the Garmin nüvi 500 provides a high-sensitivity GPS receiver with turn-by-turn navigation in a ruggedized, waterproof exterior that you can use while hiking, biking, or boating. With its high-sensitivity, WAAS-enabled GPS receiver and HotFix satellite prediction, nüvi 500 locates your position quickly and precisely and maintains its GPS location even in heavy cover and deep canyons--whether in the city or out in the wilds. And it easily switches modes (driving, walking, biking and boating) to navigate through your active lifestyle depending on your activity. 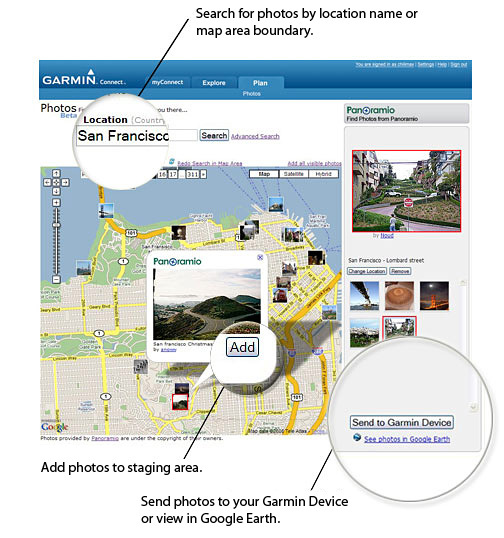 Other features include a 3.5-inch touchscreen, microSD memory expansion, geocaching GPX file capabilities for complete cache descriptions and hints, and Garmin Connect Photos--enabling you to associate your favorite images with saved locations. The waterproof nüvi 500 guides you while you drive, hike, bike or boat. The nüvi 500 comes preloaded with the highly detailed City Navigator North America NT maps for the lower 48 states, which also includes topographic maps for a better perspective of your elevation. The map data, provided by NAVTEQ, features over six million points of interest, including hotels, restaurants, gas stations, ATMs and attractions. Weighing 7.6 ounces and measuring less than an inch thin, the nüvi 500 fits easily in a purse, backpack, or jacket pocket. The 3.5-inch color touchscreen display (with 320 x 240-pixel resolution) is easy to read even in direct sunlight, and the nüvi's easy-to-use interface means you'll spend more time enjoying the outdoors and less time searching for information. Simple controls and sub-screens make it easy to enter or search for destinations and get data about your trip. Simply touch the color screen to enter a destination, and nüvi takes you there with turn-by-turn voice directions, 2-D or 3-D maps and smooth map updates as you navigate. Its digital elevation model (DEM) mapping shows you shaded contours at higher zoom levels, giving you a big picture of the surrounding terrain. In addition, the nüvi accepts custom points of interest (POIs), such as school zones and safety cameras and lets you set proximity alerts to warn you of upcoming POIs. Garmin's HotFix capability automatically calculates and stores satellite locations, greatly reducing satellite acquisition time so that you can turn the unit on and get going. With HotFix, your nüvi 500 remembers the position of all satellites it is tracking when you turn it off, and calculates their movements in order to predict where they should be the next time you turn it on. HotFix can predict satellite positions for up to 3 days after the device was last turned off. Conveniently plug in optional preloaded microSD memory cards for all your outdoor activities on land or water. Just insert an optional Garmin MapSource card with detailed street maps (such as for locales outside the United States), and the nüvi 500 provides turn-by-turn directions to your destination. And with optional BlueChart g2 Vision maps, you'll get everything you need for a great day on the water including depth contours, navaids and harbors. Plus, a user-replaceable lithium-ion battery will give you up to eight hours of battery life (depending on use). This nüvi GPS device is compatible with Wherigo, the latest GPS-based activity from geocaching pioneers Groundspeak. Wherigo (pronounced "where I go") is a toolset for creating and playing location-based multimedia experiences in the real world. Using the Wherigo platform, Wherigo authors can build exciting adventure games, historical tours or other innovative activities.